I made the big wheel and tire swap last week. Since the BMW is almost done, I’m returning the MINI to normal–well closer to normal. I swapped out the R-comps on the MINI race wheels for a street tire. I took out the rear strutbar and removed the splitter. I also sold the MINI 15 inch wheels and moved the RA1s on to a new set of 15×7 lightweight wheels for the BMW. 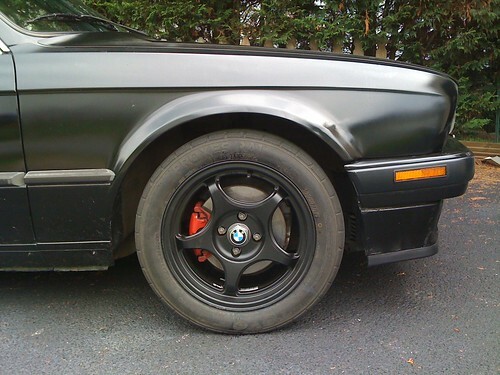 I also picked up another set of 16 inch wheels to put on the BMW with my old Goodyear F1 Tires. The 15 inch wheels have already sold and a couple of people are interested in the Hankooks. I should be close to break-even when all the dust settles. 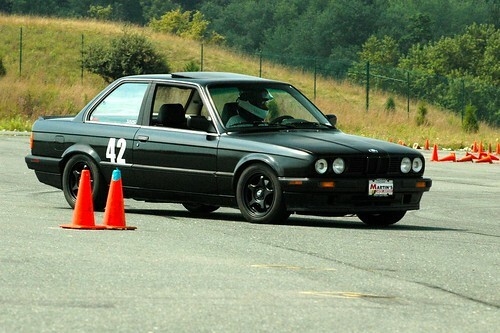 It was a beautiful day for an August autocross–not too hot and not too humid. The NCC course at the Maryland State Police Training Center was fairly simple. There was a slolom, Chicago box, a couple of sweepers, and a skidpad circle at the end. 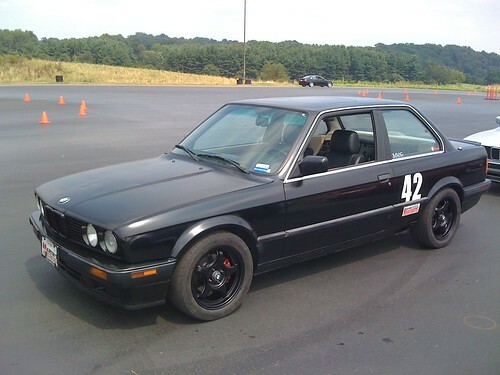 I haven’t swapped out the driveline yet so I still can’t hammer the throttle, but I managed to win my class (I’m not saying how big the field was….) 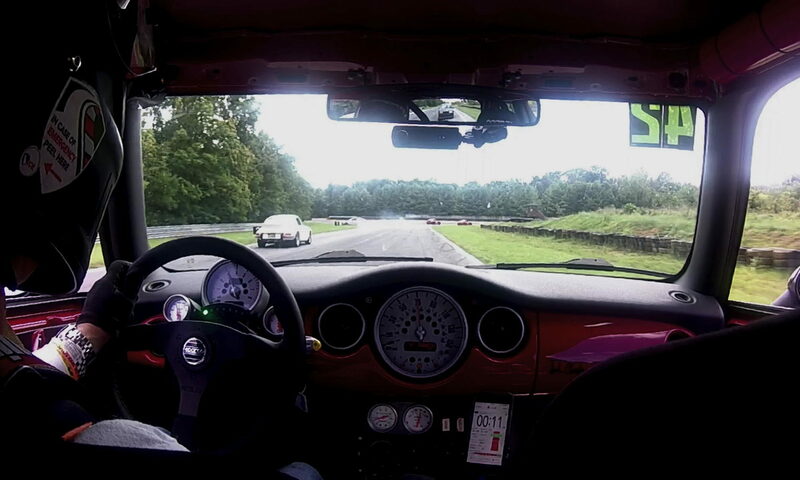 I’ve been working on smoothness and steering as the rack in the BMW isn’t as fast as the MINI. I really enjoy driving it even if the power is at the wrong end. I mounted the new autocross wheels stepped back, and it struck me how much darker my car has become. Not that it’s a bad thing, just sort of a slow change over time. Tinted windows, blacked out grille, and now black racing wheels. Add mirror caps and a roof sticker and the change will be complete. It turns out that my new Konig Feather wheels won’t work with the stock size lug nuts. 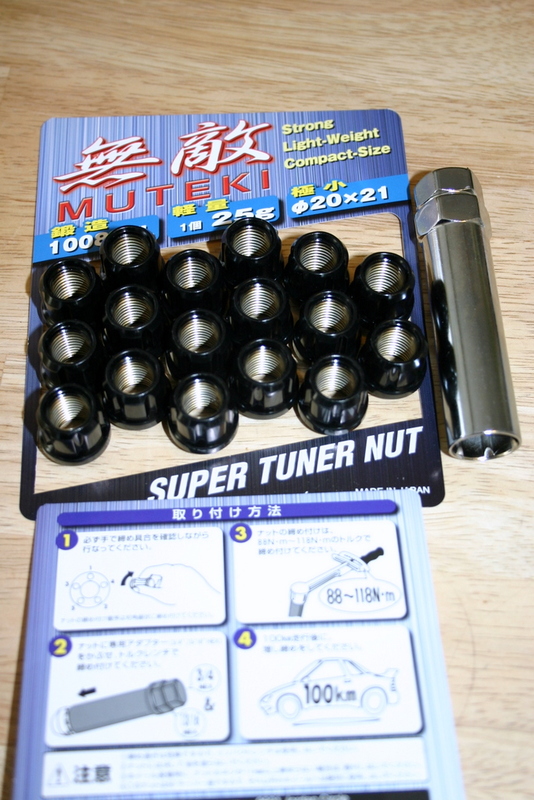 They require “tuner” nuts. Who knew such a thing even existed? So now I have my first ever JDM parts. 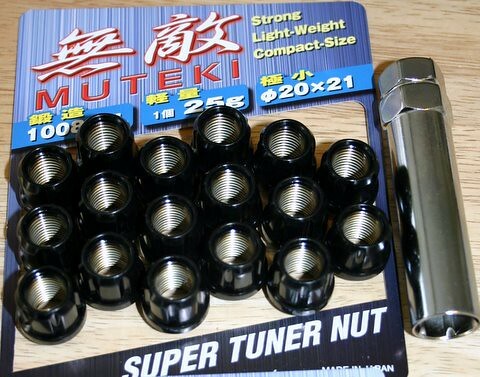 At the widest point, the Muteki nuts are about 1/16 of an inch smaller in diameter than the stock lug nuts. This allows the nut to fit in the narrow hole of the Konig wheel. 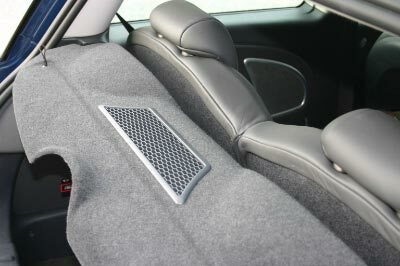 They have a narrow, barrel design that requires a special socket to be used. I figured it was a good idea to get an extra nut and spare socket since it’s non-standard. If you look carefully at the stock nut, you can see a line that is the limit of where it makes contact with the wheel. It looks like the amount of surface area in contact will actually be the same for both nuts which is good news. This summer is flying by. Just yesterday I was getting ready for annual training at Fort Dix and now we’ll be off to the Monterey Historics in a few short weeks. Along the way, I had a chance to make a couple of mods to the Mini: a rear strut bar and the fog/brakelight mod. Since I made the switch away from the runflats, I’ve been carrying a compact spare in the boot. Thanks to the nifty carrying bag I got from the Baglady, I have the spare, jack, and tools all in one convenient indi-blue package. It was previously secured by a complex web of bungie cords. I’ve been concerned what might actually happen to this +40 lbs package in the event of an accident or sudden stop. 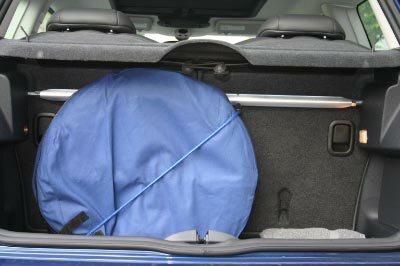 So I started looking for a way to secure it without throwing the weight into the seat-back. It finally occurred to me that I could get one of those strut bars for the rear and just tie the tire bag to it and the bar would take the weight of the tire and also strengthen the rear end. Win-win. I started looking at the usual Mini related websites and typically found one for around $130 but I didn’t want to spend that much, especially since I wasn’t really using it for it’s intended purpose. Once again, eBay came to my rescue. For about $70 delivered, I found what appears to be the same product. Installation took less than 10 minutes. 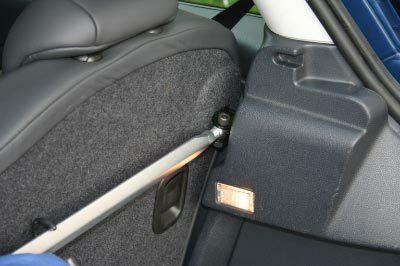 The bar repositions the rear seats to a slightly more vertical position and creates a 1 1/2 inch gap between the seat back and rear package shelf, but when the hatch is closed you cannot really tell the difference. 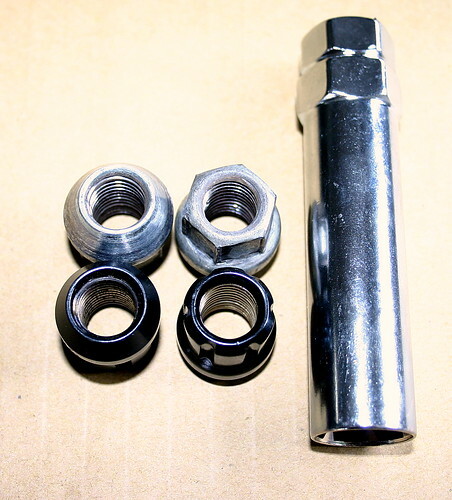 You also lose some versatility by having the bar in the way of larger packages, but it comes out in just a few seconds with a 13mm wrench. My previous solution (15 inch wheels) was a vast improvement over the stock 17 inch R85s with runflats, but they just didn’t look right. I wanted something with a low profile tire, but not too low. I wanted a larger wheel, but not the weight of the 17 inch S-Lites. In the end, my favorite wheel turned out to be the best value as well…. I reviewed the wheel galleries on Mini2 and North American Motoring before finally deciding that I wanted to stick with a MINI branded wheel. 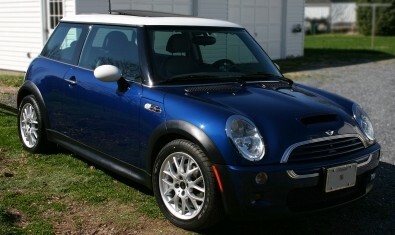 I got a great deal from Mini of Sterling and be sure to mention “Roadfly.org” for a great discount. It wasn’t the lowest price I could find on the internet, but since they threw in free shipping on orders over $100, it was as competitive. I knew from my time with the runflats that I didn’t want another 17 inch wheel. The R82s with Falken ze-512s did great in the snow, but the 15 inch wheel just doesn’t look right. I’ve always like the R90s so I decided the 16 inch R90 was the wheel for me. I reviewed many tires and found a summer performance tire that got excellent reviews in both consumer reports and on the Tire Rack — the Goodyear F1 GS-D3. The tire has a very square sidewall construction so the contact patch is huge in the 205/50R16 tire size. So far the ride is comfortable and quiet; the tire has great grip and the wheels look great.